If your website is related to human rights and reparations issues, and you would like to see your website link placed on this page, please write to us and send us the link. 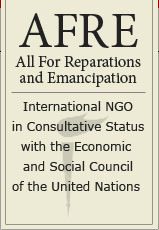 Also, please feel free to place the AFRE website among your favorite links. Disclaimer: AFRE is not able to verify the accuracy of the information in all of the websites that we present on this page.